6WINDGate’s unique value proposition is seamless integration with Linux. This is paramount to our core transparency philosophy and no other vendor can claim this. It starts with support for all major Linux distributions, where existing Linux management tools can be reused with no changes. We support third-party open source control plane applications such as FR Routing and StrongSwan. We also work with third party management tools, either open source such as Ganglia, Grafana, Nagios and OpenStack or commercial such as Canonical and Mirantis, and Midokura and Nuage SDN controllers. In the 6WINDGate architecture, the fast path runs on the side of the Linux networking stack and receives all the packets arriving in the system. The fast path checks in its local information base how to process the packet. If the information is there, the packet is processed very efficiently by the fast path’s fast algorithms, without involving the Linux networking stack or the control plane. 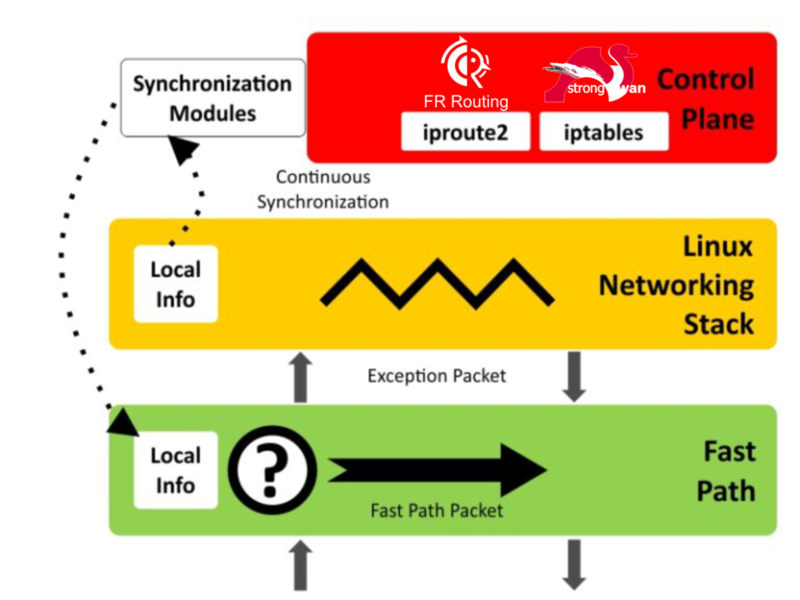 If the packet is intended at Linux, or if the fast path doesn’t know how to process it (for example there is no ARP entry for a connected IP destination), it is sent to Linux. This is the exception mechanism. This mechanism is totally transparent to Linux. While Linux processes the packet, it learns new information (for example the missing ARP entry). The 6WINDGate synchronization module catches the new event and configures the fast path accordingly. This is the continuous synchronization mechanism. And this mechanism again acts transparently, so that existing Linux applications don’t need to be modified. Thanks to these two mechanisms: exception mechanism and continuous synchronization mechanism, the fast path is integrated with the rest of the Linux networking environment. And this integration is transparent to Linux, which means that no modification is needed to the Linux networking stack, control plane or management applications. Because of our transparency philosophy, developing new applications is pure Linux development. Linux running 6WINDGate is Linux.